GSC Power-Division S1 cams for the Toyota Supra 2JZ-GTE. The S1 cams are designed for those running an upgraded single turbo larger than 57mm. These cams will not have bottom end losses over stock cams; nothing but gains and will promote an extremly flat torque curve. Gains of 40-70whp (depending on Turbo) have been seen by simply bolting the S1 cams in and reshimming. Designed for a rev range of 3500-8000rpms, these cams require a single valve spring upgrade over stock. 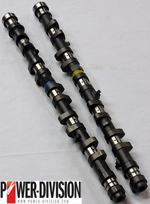 450-800whp camshaft set with an idle slightly ruffer than stock.